My edition: paperback, to be published on 25 September 2014 by Michael Joseph, 414 pages. Description: With the Wife Project complete, Don settles happily into a new job and married life in New York. But it's not long before certain events are taken out of his control and it's time to embark on a new project . . .
As Don tries to get to grips with the requirements of starting a family, his unusual research style soon gets him into trouble. To make matters more difficult, Don has invited his closest friend to stay with them, but Gene is not exactly a prime example of marital happiness, and as his life with Rosie continues to be unpredictable Don needs to remember that emotional support is just as important as his practical expertise . . . Early last year I had the pleasure of reading a proof copy of The Rosie Project (read my full review here), which was my first introduction to the highly intelligent and socially awkward professor Don Tillman. The focus of the story The Wife Project, which eventually led Don to meet Rosie, fall in love and get married. Because his brain is wired differently and he doesn't feel or show emotions like a "normal" person he never thought marriage was for him, but it turned out he just hadn't met the right person yet; Rosie. Now they live together in New York City, where he works at Columbia University medical school and she is finishing her PhD thesis, and they're about to face the next stage in their lives: parenthood. Normally Don plans everything meticulously but their pregnancy takes them by surprise and he knows he isn't yet ready. Not having many people to talk to about his worries he asks his best friend Gene - who is temporarily living with them in NYC as his own marriage is on the rocks - for advice, but as Gene isn't exactly a role model this only makes matters worse. Before Don knows it he is at risk of getting a criminal record and having to leave the country, forced into therapy and things between him and Rosie are rapidly falling apart. Doubting himself and his marriage, Don has to make the ultimate decision: Can he be a parent or is his brain just wired too differently? Should he give it a shot or should be give up his life with Rosie and go back to how things used to be? First of all, why this book wasn't called The Bud Project or The Baby Project (the latter of which is actually used within the novel) is baffling to me. I understand that they wanted 'Rosie' in the title again for continuity reasons, but the 'Effect' part really doesn't suit. Or I think so, at least. Anyway, on to the more important part of this review... the story. Initially I thought that author Graeme Simsion wouldn't be able to replicate the unique humour of his first novel as the readers by now would be used to Don's different approach to everyday things in life, but I actually found it much more fresh this time around. And where I personally found it a little difficult to get used to Don's voice myself in the first novel, when opening the pages of the second installment (in what I assume is to become a series) it felt like revisiting an old friend and I found it easy to be pulled back into the peculiar world of the professor. Just as Don has found his Rosie, so has Simsion found Don's voice. One thing that did grate on me a little while reading, was Rosie's changing attitude to Don. It may have been the hormones that made her so intolerant, but I found that what she largely blamed Don for and which was a major reason for their marriage falling apart, was actually nothing to do with Don's inability to connect with other humans on an emotional level. Rather it was that it's neigh impossible for prospective fathers to connect intensely to their unborn child as they don't have the literal physical connection, like the mother does. In a way their parenthood doesn't become real until the child is born and they can hold and feel it for themselves. 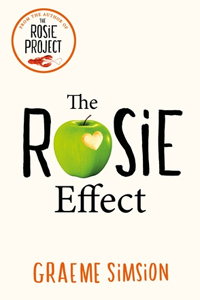 Despite this minor niggle, I found The Rosie Effect a worthy sequel to The Rosie Project. The novel was both humorous and though-provoking while capturing the charm and peculiarity of the first book perfectly, making it work even better this time around. I also liked and understood Don better after having spent more time with him and I look forward already to what Graeme Simsion has in store for his leading man next, as I'm positive that his story has only just begun. Would you like to know more about the author? You can connect with him online via his website graemesimsion.com and on Twitter at @GraemeSimsion. Many thanks to Lovereading for a copy of the novel in exchange for a honest review.